Somali militants have killed 36 non-Muslim quarry workers near the north Kenyan town of Mandera. The attackers from the al-Shabab group shot the non-Muslims dead after separating them from Muslims, residents said. There is growing concern in Kenya about security in regions bordering Somalia after a spate of attacks. Al-Shabab killed 28 people in an attack on a bus targeting non-Muslims in the same area last week. The attack on the quarry workers took place early on Tuesday. 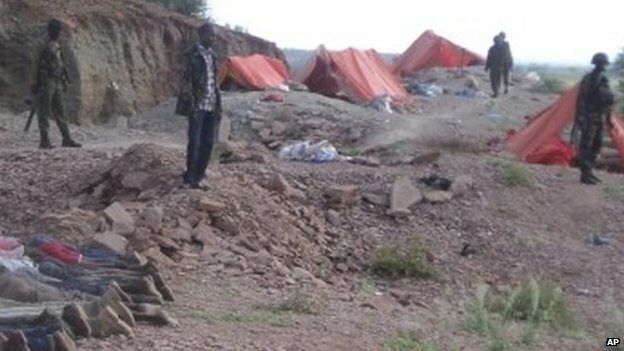 Witnesses said the victims were caught after midnight, while sleeping in their tents at the quarry in Kormey, 15km (nine miles) from Mandera town. A driver who visited the scene of the attack, Ali Sheikh Yusuf, told the BBC most of the victims appeared to have been lined up, and shot in the head, at close range. He said four were beheaded inside their tents, while three appeared to have escaped to Mandera town. Al-Shabab said it carried out the attack, blaming the involvement of Kenyan forces in Somalia “and their ongoing atrocities therein, such as the recent air strikes on Muslims”. The group put the number of killed at 40, higher than official accounts. In response to the killings, President Uhuru Kenyatta has summoned senior security officials. Kenya’s Red Cross said that security personnel and one of its own teams were at the scene soon after the attack. Earlier, one person was killed in a bar popular with non-Muslims in a neighbouring district. On Monday night, gunmen reportedly opened fire and hurled grenades at the bar in the town of Wajir, killing one and injuring 12. Mandera County borders both Somalia and Ethiopia, and it is dominated by Somalis, who are largely Muslims. Many of the quarry workers killed are reported to have come from the south of the country where Christians predominate. Al-Shabab has stepped up its campaign in Kenya since 2011, when Kenya sent troops across the border to help battle the militants. Mandera is dominated by Kenyan Somalis, most of whom are Muslims. The attacks will affect the economy and social make-up of the region, as most of its workers – skilled and unskilled – are non-Muslims from other parts of Kenya. Many of them – including nurses and teachers – fled Mandera after last week’s bus attack, and this trend is now likely to continue. A presidential adviser, who hails from Mandera, Abdikadir Mohamed, has warned that al-Shabab is trying to fan a religious war. Some Christian leaders have also publicly accused Muslim leaders of not doing enough to tame radicalism within their ranks. 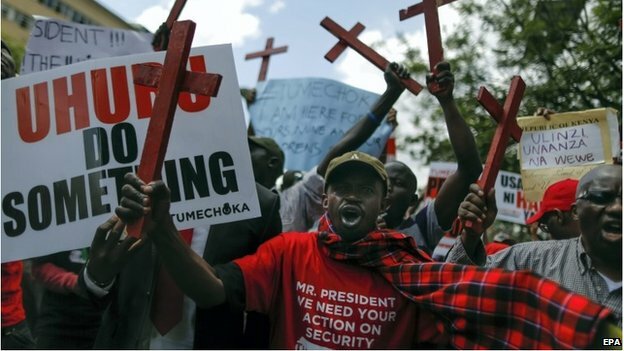 The Kenyan government is being blamed for failing to secure the nation, and this attack will put more pressure on President Uhuru Kenyatta to step up efforts to end the insurgency. In one of the worst attacks on Kenyan soil, 67 people were killed last year when four gunmen took over the Westgate shopping mall in Nairobi. 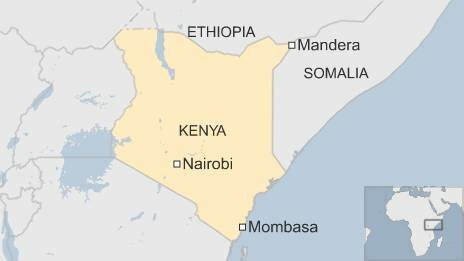 More recently, dozens of people were killed in a series of shooting attacks in Kenya’s coastal districts. The security situation has led to calls from the opposition and some in the governing party for the dismissal of Interior Minister Joseph Ole Lenku and police chief David Kimaiyo. Hundreds of people sought refuge at a military airstrip in the Mandera region last week, fearing a fresh assault by al-Shabab. Posted on 2nd December 2014 by newsafrica. This entry was posted in Africa, Kenya, Mombasa Terror Threat. Bookmark the permalink.